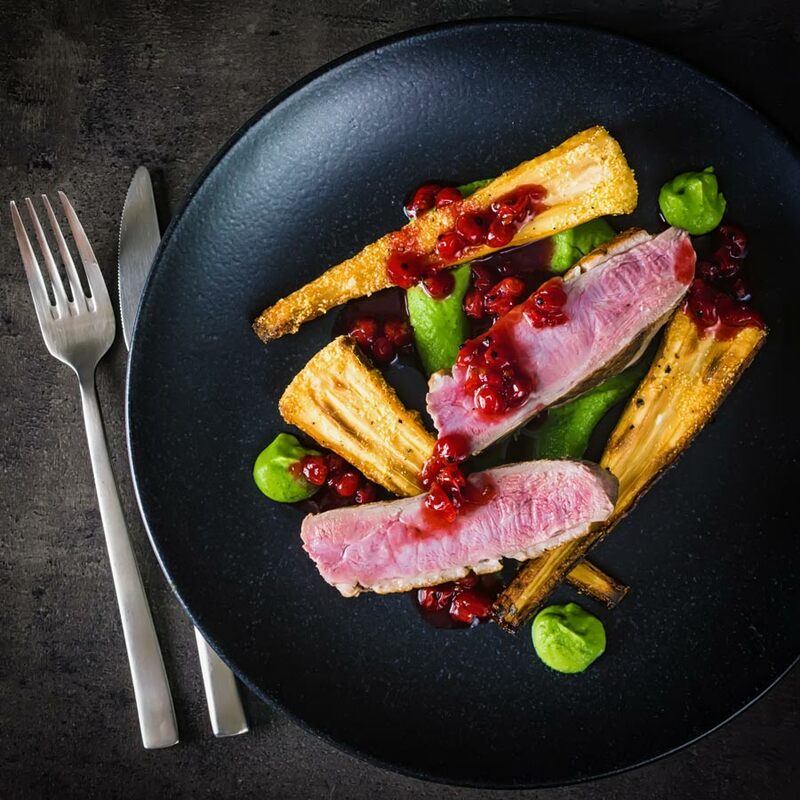 This pan fried duck breast is cooked using the cold pan method and is joined by honey roast parsnip, broccoli puree and a red currant sauce to form the perfect date night dinner! Pan Fried Duck Breast With Broccoli Puree and Honey Roast Parsnips. 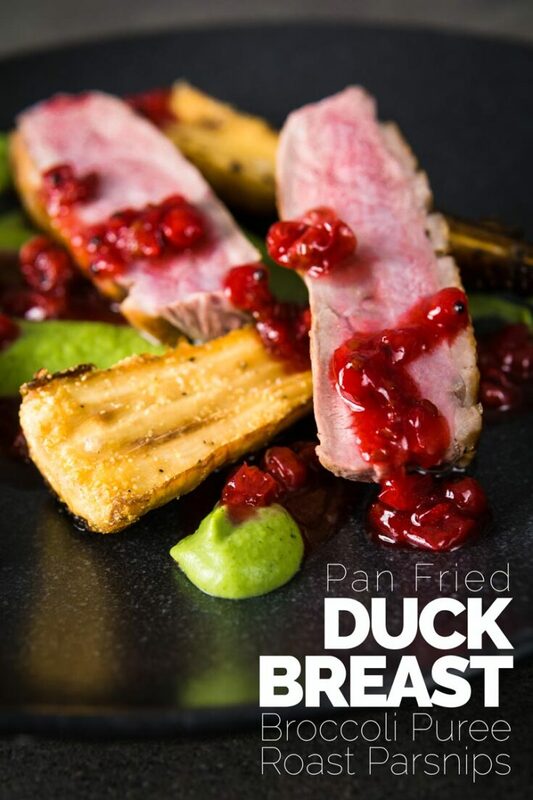 This pan fried duck breast recipe is very much an ensemble dish that many would have broken into four recipes. 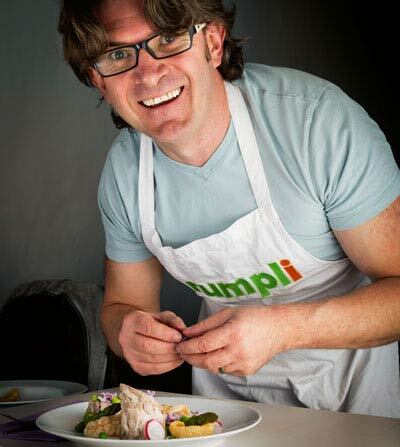 I hate bouncing all over the internet when looking for meals, as a result, I like to create complete meals on my site. Only bouncing out to another page when an element is too complicated to wrap up in a single recipe. It is also incredibly versatile and is capable of standing out among the strongest of flavours. So it works just as well here as it does in my Teriyaki Duck Donburi as well as standing up to curry in my duck tikka masala! As you can tell I like my duck breast cooked pink and this recipe uses the cold pan method of cooking. But more on that later! 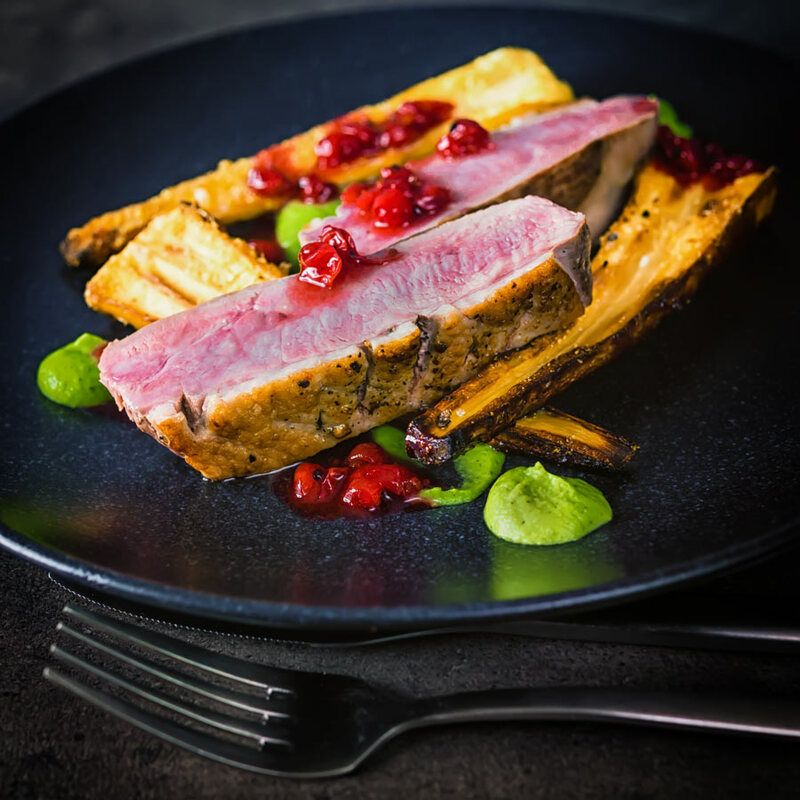 There are four elements to this duck breast recipe and all are there to provide a contrast and compliment to the duck breast. Our silky broccoli puree provides a beautiful earthy and salty soft element. This is balanced with the sweet crunch exterior and fluffy interior of the honey roast parsnips. Now that sweetness needs a counterpoint so we have a wonderfully tart, but not too tart red currant wine sauce. All this is rounded out with a perfect pan-fried duck breast! Cooking Duck Breast, The Cold Pan Method. I am a relatively new convert to the cold pan method of cooking duck. For years I swore by the hot pan method, first searing the duck and then reducing the heat. I was really happy with this method and it is the one I use in my balsamic and honey glazed duck breast recipe. The cold pan method flips this on its head. Placing seasoned duck breast skin side down in a pan and cooking on a medium-low heat until the skin is crispy. Then you flip over and finish cooking on the other side either on the stove or oven. The theory of this approach is that it renders the fat more completely. Now they say you can’t teach an old dog new tricks, but I am a convert. As far as I am concerned this is now the secret to perfectly cooked pan fried duck breast! There are many who like handing out pretentious judgements about how folk like their meat cooked. I like my duck breast pink, but if you don’t that is fine we can cook it longer. The first thing to do is buy a meat thermometer. Seriously they cost the equivalent of 5-10 dollars and will instantly make you a better cook! It removes all guesswork when it comes to cooking meat. My instructions in this pan-fried duck breast recipe are to cook the meat to my liking. If you want to cook your meat to a greater degree, transfer it to the oven and let it sit. You should bear in mind that the resting period will increase the temperature of the meat by 5-8°C. If you have been hanging out here for any period of time you will know I like to be creative with putting things on a plate. I am most definitely not an advocate of a sprig of parsley and heaven forbid a tree of rosemary! It absolutely does not make things taste any better. It does, however, make whoever you put food in front of feel great about their dinner! I do not advocate painting stuff on a plate and piling stuff up in ridiculous ways. Just a little consideration as to how you put colours and textures together visually. It adds no extra time to cooking a meal and adds a little flair. 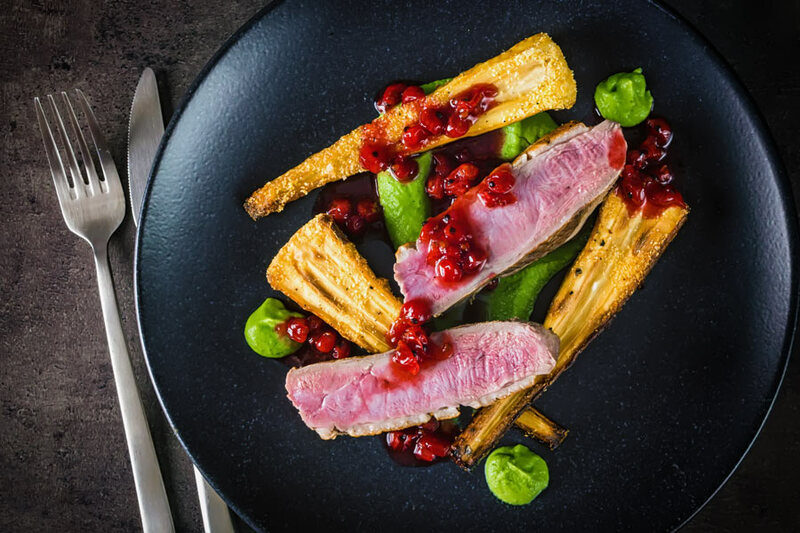 Whether it is taking meat and two veg, as in this pan fried duck breast recipe and making it look pretty. Or indeed a simple bowl of pasta you can always make it look purdy that is not a liberal sprinkling of parsley! Top and tail your parsnips then cook on a rolling boil in salted water for 5 minutes. Drain the parsnips and let them steam 'dry'. Place in a roasting tin and then sprinkle over the polenta. then add the honey, cooking oil and butter. Mix and season with salt and pepper before roasting at 180°C or 350°F for 40 minutes. Finely chop your broccoli florets. Add the broccoli and cook for 8-10 minutes. Chop the parsley and add it to the parsley and stir. Remove from the heat and then drain the broccoli and place in a blender and blitz to a puree. Add the cooking liquid as required to create the desired texture. You can do this in advance and chill in the fridge bringing back to temperature before serving. Heat a pan over a medium-high heat and add the wine. Add the red currants, sugar, and rosemary. Reduce the sauce by half and season with salt. Ensure the duck breasts are dry and then score the skin in a 1cm crosshatch. Season the skin side with salt and pepper generously. Place skin side down in a cold pan. Then turn on the heat to low-medium and allow the duck to cook untouched for 12-15 minutes. You are looking for a nice golden colour and ensure you drain off any duck fat as you go. Flip over, turn the heat up to medium and cook for a further 5 minutes. Rest for 5 minutes under a foil tent before serving. 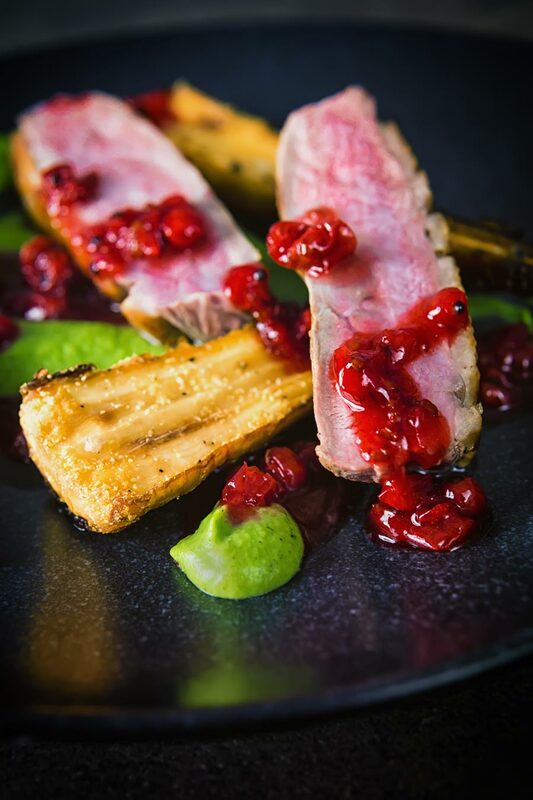 I’ve never had duck before (sacrileges I know) – it looks to be a good bit redder! One of these days am gonna have to get my hands on some as after your description of it having “bags more flavor” you have my curiosity piqued! BTW this pan fried duck breast w/ honey roast parsnip, broccoli puree and a red currant sauce is a fancy restaurant quality meal! Such a decadent and gorgeous meal! I am intrigued by this cold pan method of cooking. I’ve never tried it before and it sounds like I need to! Duck is one of my all time favorite meats. This is a great recipe here! It took me years to warm to it, to be honest, but it is wonderful at rendering the fat out of the duck leaving a wonderful crisp skin and lots of duck fat for roasting potatoes later! Thanks Katherine, it is a fab meal all of the processes gel together nicely too with lots of prep possible in advance so for all the fancy presentation it really is meat and two veg and no real stress in the kitchen. It’s actually really quite easy too, it is four quite simple recipes that do not really require constant attention. My husband loves duck but I never cook it. I am going to have to give this a go.